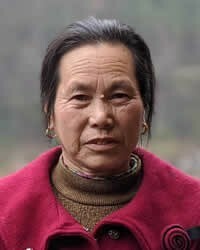 Although they are officially part of the Miao nationality, the Aoka speak a unique Chinese language - a fact they apparently refuse to accept. When linguists visited them and told them that they spoke a form of Chinese, "they claimed that they spoke Miao, because their speech was very different from that of the surrounding Chinese population, and because they wore Miao clothes instead of Chinese clothes." In the aftermath of Chinese wars against them, the ancestors of the Aoka were launched into an era of migration. Tired of being harassed, they fled across mountain ranges in hope of finding an isolated place where they could be left alone to live their lives. Many of the ethnic groups now known as the Hmu also traveled into Hunan and Guangxi. They may be the ancestors of the Aoka. After centuries of living beside the all-powerful Han Chinese, the Aoka have lost their language and are being speedily assimilated to the Han Chinese language and culture. Aoka communities work together as one to design and build homes for each other. During a crisis, all the people come together to find a solution. In many villages, the Aoka believe the stove is the center of their home and they are afraid to offend the "spirit of the stove". They are forbidden to place their feet or shoes on the stove, and at night they must remove all pots and pans from it: not to do so is believed to bring a curse to the family. Some Aoka believe there was once a ladder connecting heaven to the earth. A long time ago the ladder was broken and no people have been able to visit heaven since. Today the majority of Aoka are animists, living under the influence of demons and evil spirits. Many have also adopted the ancestor worship belief systems of their Han Chinese neighbors. More than three-quarters of Aoka people have yet to hear the gospel for the first time. No widespread mission effort was undertaken in their area before missionaries were expelled from China in the early 1950s. There are few Miao or Han Chinese Christian communities in that part of China today. 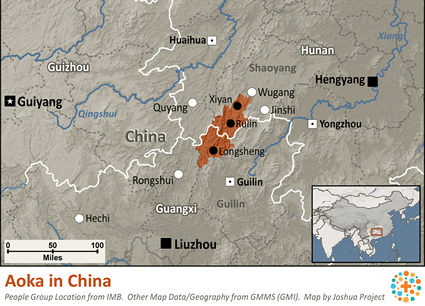 Hunan remains one of the most unreached provinces in China. Although they have their own spoken language, the Aoka use the Chinese script for writing. Few Aoka, however, are literate enough to read the Chinese Bible or other evangelistic literature. View Aoka in all countries. Location in Country: The 1991 Encyclopedic Dictionary of Chinese Linguistics lists 200,000 Aoka people who speak the Maojia language, also known as Qingyi Miao. They are located in the mountains of Chengbu County in southwestern Hunan Province; and also in the Ziyun District of Longsheng County in the northeastern part of the Guangxi Zhuang Autonomous Region.